What will you be dishing up this Thanksgiving? 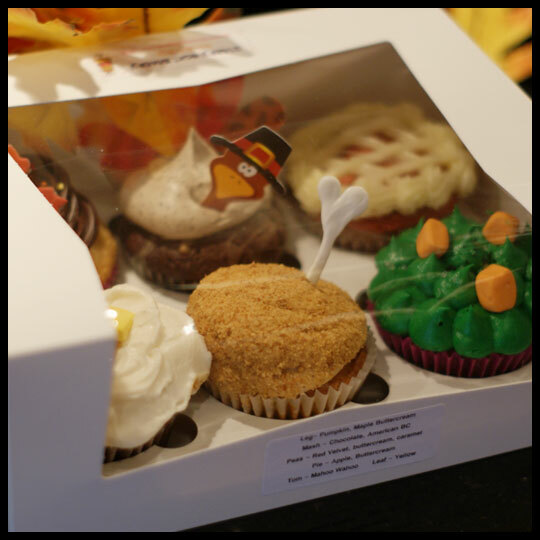 The Cupcake Crusaders knew that we had to celebrate Thanksgiving in “Cupcake Style,” so when we saw what Starry Night Bakery and Coffeehouse had up their sleeve for this holiday the temptation was too much to bare. I couldn’t wait to get these masterpieces out of the box to more closely admire them. 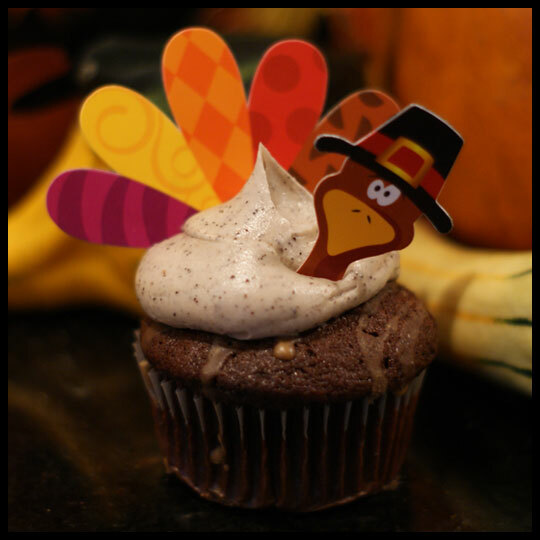 While I was most excited about the cupcakes that looked like Thanksgiving staples, I also appreciated the festiveness of the turkey character and the simple leaf on top of chocolate icing. 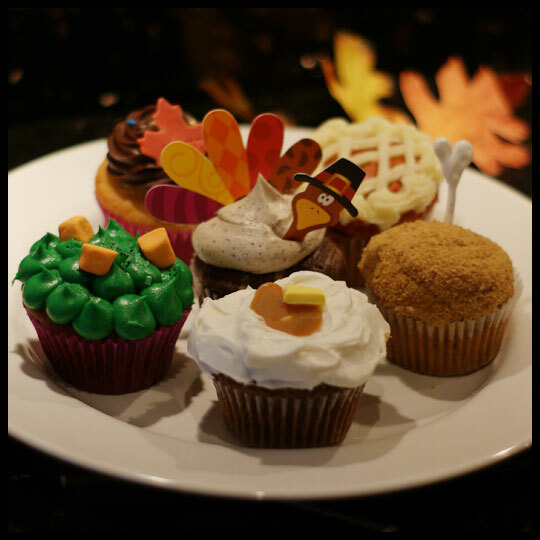 Starry Night chose to take one of their special Cupcake Wars’ cupcakes, Mahoo Wahoo, and dress it up for the holiday with a cartoon turkey. This centerpiece for the collection is a good place to start. While the flavors are not your typical for the season, the coffee taste for me represents the warmth that you expect this time of year. This cupcake uses Kona Coffee and is a chocolate cake with coffee drizzle glaze and coffee buttercream. If you like coffee and you like it strong, as I do, then this is the cupcake for you! Paired with the chocolate and it’s a match made in heaven. 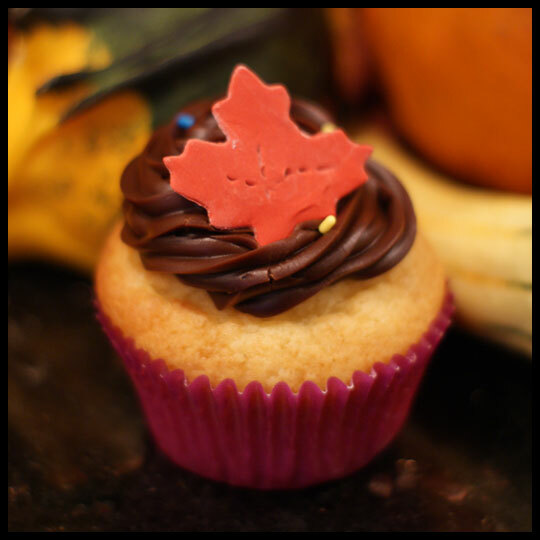 Next in my selection was the Turkey Leg, which is their seasonal Pumpkin Maple cupcake (read a past review here). 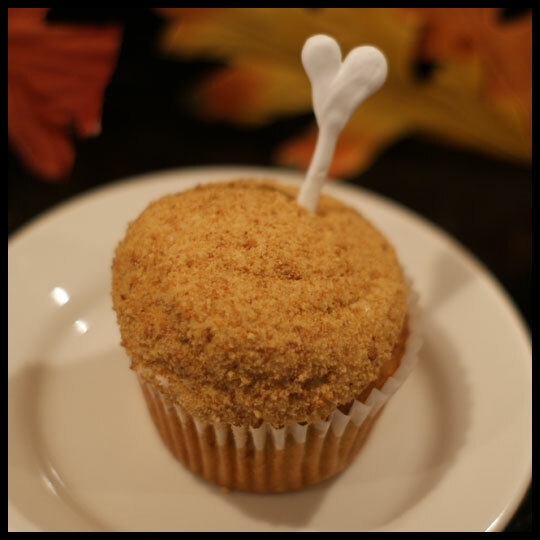 While the decoration is seemingly simple, using crumbs and a candy bone sticking out of the frosting, it really looks like a turkey leg! And, what Thanksgiving would be complete without it? As for flavor, this is probably the 5th or 6th time I’ve had this cupcake this season. The maple flavor paired with pumpkin is a new favorite of mine and I just can’t get enough. Moving around the dinner plate brings us to the Mashed Potatoes, or in this case chocolate cake with buttercream frosting, topped with a dollop of caramel. 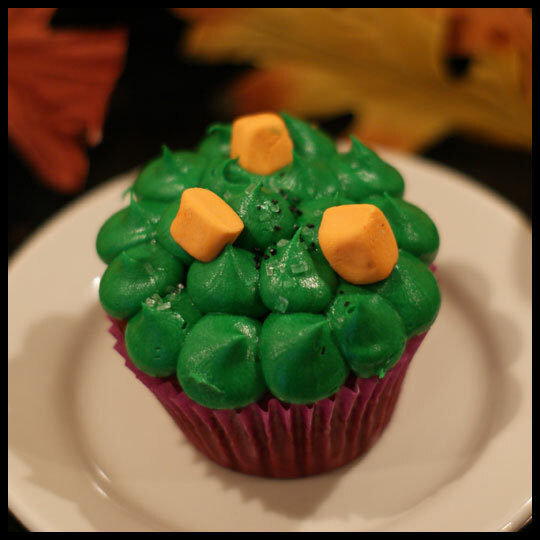 This cupcake flavor falls into Starry Nights “Standards” and while it was tasty, with a buttercream icing that is just right, the cake wasn’t as chocolaty rich and moist as I would have liked. I wouldn’t say that it was dry, but I do prefer a decadently moist chocolate cake and this was not it. However, the caramel “gravy” did take the flavor to the next level and really makes me wish they plopped caramel on more frequently. As with any dinner plate, there’s always a veggie. In this case it was Peas and Carrots, or a Red Velvet cupcake with buttercream frosting. The detail in the decoration impressed me, right down to the sugar mimicking salt and pepper specks. I’m not usually a fan of peas and carrots, or Red Velvet, but was hoping for this cupcake to change my mind. Red Velvet is just so difficult to do correctly so I feel like most places should just skip it. While the flavor of this cake was good, better than most actually, the cake was dry so I wouldn’t recommend this for Crusader Elisa who knows her Red Velvet cupcakes. Also, while the butter cream icing was very good, I do prefer a cream cheese frosting on Red Velvet. Continuing around the plate, takes us to dessert! In this case what looks like a sweet potato pie, but what is really an apple cake with buttercream frosting. I’m assuming this cake is the same used in their Salted Caramel Apple seasonal cupcake (read a past review here). 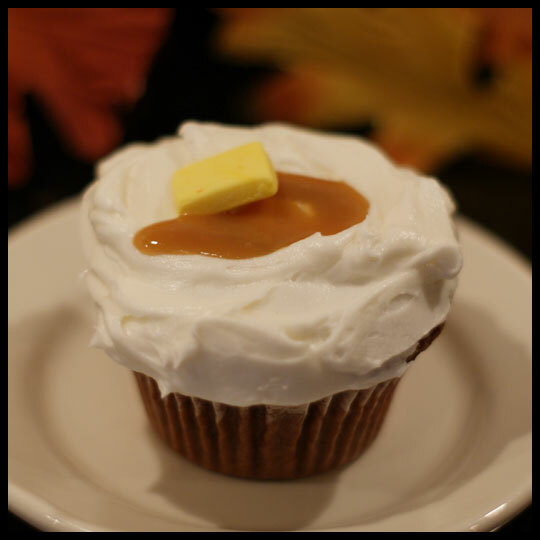 I was concerned that it wouldn’t be as good without the caramel buttercream, but this cupcake proved me wrong. The cake is just so good! Moist, flavorful, chunks of apple, need I continue? Topped with their perfect, not too sweet, buttercream really worked and it lets the cake be the star flavor, which I really appreciated. Last on our plate is the Vanilla Cake with Chocolate Ganache frosting, adorned with some festive sprinkles and a fondant leaf. As with the chocolate cake, this cupcake could have been more moist. Not that it was what I would call dry, because I’ve had some very dry cupcakes, but it just could have been better. However, this is the same chocolate ganache frosting that was on their Halloween cupcake (see here) and I could eat tubs of it. Like with any meal, some things stand out as the stars and others not so much. Over all I was pleased with what Starry Night brought to the table this Thanksgiving and I’m very thankful to have such a tasty bakery just minutes away! If you have a chance to stop in, their “Quirky” cupcakes are the way to go! What will you bring to the table this Thanksgiving? 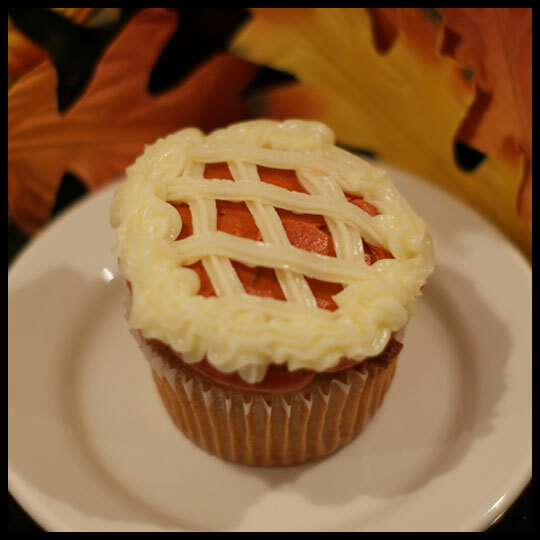 This entry was posted in Cupcake Wars, Cupcakes, Maryland and tagged Cupcake, Cupcake Wars, Starry Night, Thanksgiving, Westminster by Crusader Jenn. Bookmark the permalink. These cupcakes are amazing! The decorations alone show the detail and dedication Starry Night has for their cupcakes. I can’t wait to see what they have planned for Christmas! Elisa, I’m so excited to see what their winter seasonal cupcakes will be! And, these were so much fun to photograph. I took 70+ photos before selecting the ones you see!